It was good to be with Wilf and Val again. Nothing had changed in Rolleston Place except that a few houses had been re-painted. No one had died and there were still lots of children everywhere; there were also lots of grandchildren. The girls were made to sing and perform for everyone just like we used to*. There were muffled giggles at their accents and their Indian head wobbles. Dave and Bev brought their three boys Jonathan, Cameron and Mitchell around and there was lots of dancing and jiving in the lounge. 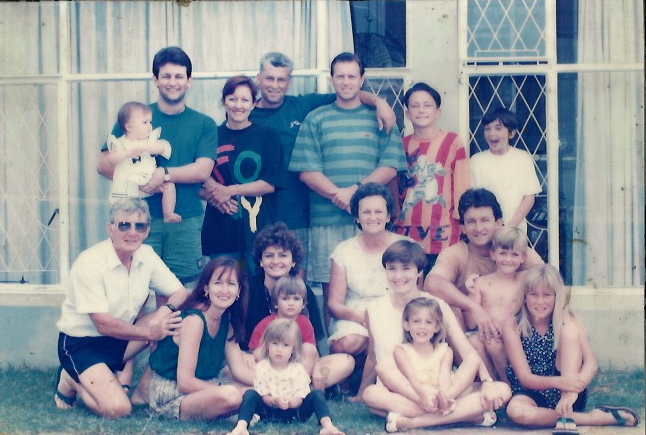 Peter and Char had little Kendal and Rig and Sue came with Ryan and Leigh. No. 28 * was brimming with life again. We spent lots of time in the pool and soaked up all the sun we could get. We had come from another cold winter in Mussoorie. 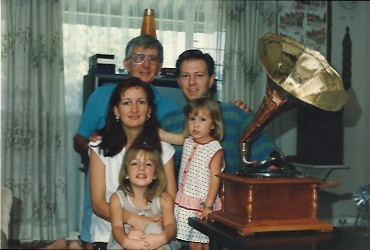 Wilf was so surprised with his gramophone. He got really tearful and even more emotional when it actually worked. It was amazing to hear an old vinyl playing with all its funky crackles and scratchy sounds. Val took me shopping. What a traumatic experience. She needed to do a big shop so I took half of her list. I had no idea where anything was. I hadn’t been in a supermarket with a trolley for two and a half years. It was BIG. It took me ages to get the goods and I made my way back to Val. Everything I had was the wrong brand. In Mussoorie we had no name brand sugar, flour and milk. They all came in clear plastic bags. As Val started to take things out and put them back, I started crying again. I told her I would meet her outside. I didn’t want to go near another supermarket. Not ever. I had changed. Everything in me had been shaken up. My worldview was different. I shuddered when my family still called their house helpers “girls” no matter how old they were. They still called their gardeners “boys” or “John” even though they had names. There was so much I didn’t like and I had to constantly remind myself to not be critical. Being with my family again made me think. How often we lock people up in the boxes of our past. We presume they are the same as they were a year ago or even a few months ago. There is an expectation for them to behave a certain way and when they don’t we are taken by surprise. That holiday together helped me to let people out of those boxes I had put them in. He is like that, she is like that or even I am like that. We change. We are flexible and adjustable. We can go from one culture to another and adjust to it. It may be difficult but it’s not impossible. I may not like it or agree with it, but I can be happy in it. If I look for the good and not the bad, I will find it. If I have to use a microscope I can do that too. There is so much good in people; SO many kind, lovely people in the world. A poor man looks through the rubbish to find treasure. How often I have found myself standing in a pile of treasure, looking for rubbish.